Canada’s Finance Minister Bill Morneau was in Calgary to talk about the budget and was met by a crowd of protesters when he arrived at the Fairmont Palliser hotel on Monday morning. Canada Action held a ‘Proud, Positive and Proactive’ rally at 11 a.m. outside the downtown hotel. The group is calling on the government to get going on pipelines and says the budget ‘did next to nothing’ to help the energy industry. “Let’s make sure our message is heard across the country. It doesn’t matter who you vote for, when it comes to energy and the economy, we have to get competitive again and we have to get people back to work,” said Cody Battershill, Canada Action. 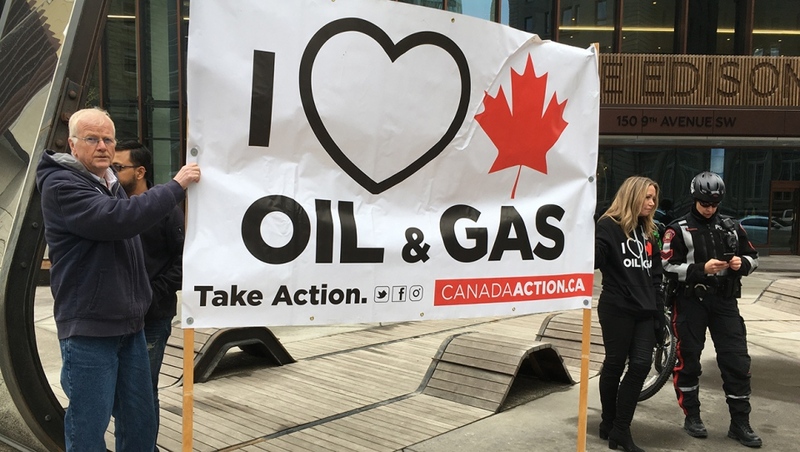 Canada Action is also protesting Bill C-48 and Bill C-69 and the group invited people to gather to show their support for the energy sector. "We're all in this together and every Canadian job is equal and matters. So it's not just SNC Lavalin and General Motors, it’s the whole country wins when the resource sector is strong and we need Bill Morneau to take action to support the unemployed Albertans and unemployed Canadian families that are out of work in the energy sector,” said Battershill. “I think we’re the best at what we do and Canadians need to know that and they also need to know they don’t exactly get oil from the best places, such as Saudi Arabia or Nigeria, where the human rights records is just terrible and Canadians nee to support this industry cause it helps us all,” said Brock Warkentin. Morneau’s speech was hosted by the Economic Club of Canada. Pro-energy protesters rallied outside a Calgary hotel where the finance minister was speaking on Monday.